<h2>Not so fantastic single-use plastic to get an eco-friendly makeover</h2><br /><p>It may come as a shock to some, but around half of all the plastic products in the world are used only once. After they enter the waste stream, these practically indestructible synthetic materials end up in landfill or oceans, persisting in the environment for hundreds of years.</p> <p>Consumer awareness is growing, and improved recycling methods help to alleviate the problem. But while plastic packaging accounts for almost&nbsp;two-thirds of all plastics used in the EU, <a href="https://waste-management-world.com/a/eu-breaks-40-mark-for-plastic-packaging-waste-recycling-in">less than half of it is ever recycled</a>.</p> <p>Reducing the volumes of plastic entering the waste stream at source would be one very effective way to prevent pollution. To do this means developing alternative packaging made from biodegradable materials derived from organic sources such as wood pulp and waste milk.</p> <p>These could be as versatile as synthetic plastics while being much more environmentally friendly, and be used for&nbsp;products ranging from dishwasher detergents and swimming pool chemicals to ready-made meals and even foodstuffs like cheese.</p> <p><strong>Milk-based</strong></p> <p>Through a project called Ecolactifilm, French company Lactips has developed a patented, milk-based thermoplastic packaging material that is biodegradable and water-soluble at low temperatures.</p> <p>The packaging film is based on casein – a protein derived from milk – and breaks down harmlessly in water or home compost. It takes just three weeks to biodegrade, claims the company.</p> <p>‘It is a truly disruptive innovation, and we can now make what was previously not possible,’ said Jean-Antoine Rochette, chief financial officer of Lactips and the company’s project officer for Ecolactifilm. Disruptive innovations are ones which have&nbsp;the potential to fundamentally change a market.</p> <p>Forming a good oxygen barrier to help keep goods fresh, the material can readily be printed with labels or usage instructions. Proposed applications for Lactips’ packaging include water treatment, agrochemicals, dishwasher capsules and even edible food packaging. ‘The main thing of interest (to industry) is that our product is fully water-soluble and fully water-soluble at cold temperatures,’ Rochette said.</p> <p>Lactips, which is based near Lyon, only uses milk that is unfit for human consumption for its non-food applications. The material is produced as small plastic pellets called nurdles that, with some adjustments, can be used in existing plastic processing machinery. But because it can be formed at lower temperatures than oil-based plastics, the process also saves energy.</p> <p>‘We are bringing new opportunities to industry, because you use it for new applications, so it is innovative,’ said Rochette, ‘But you can manage the product with the same industrial processes, and do it at the same price.’</p> <p>By using leftover protein from milk that is suitable for human consumption, however, another potential application for Lactips is edible-grade food packaging. This makes for strong prospects in packaging cheese, a substantial industry in France and other parts of Europe. It also makes for a certain symmetry, where both the product and its edible wrapper are made from milk.</p> <p>As awareness of plastic waste is growing, so too is the demand for more sustainable products. Responding to this, a project called Fresh&nbsp;is working to demonstrate that bio-based raw materials are a good alternative to ready-made food packaging and can biodegrade in compost after use.</p> <p>Steve Davey, Fresh project manager at food packaging firm Huhtamaki’s operation in Lurgan, Northern Ireland, said: ‘(We are) developing a product using a naturally based raw material, and applying the mechanics and engineering that we already have, in order to deliver something that is new and useful to the market.’&nbsp;</p> <p>If you have ever consumed a ready-made meal from a supermarket or delicatessen, you probably took delivery of your food in a black plastic tray.&nbsp;After a one-time use, the trays are discarded and although some of these containers are incinerated, others just end up in landfill.</p> <p> <div class="quote-view quotesBlock quote_horizontal"> <div class="quotesTop"><img src="https://horizon-magazine.eu/sites/all/themes/horizon/images/quotes_top.png" alt="" title="" /></div> <p>'A fully bio-based ready-meal package is vital to ensure that more sustainable products are fabricated in the packaging industry'</p> <blockquote><p>Steve Davey, Fresh, N. Ireland</p></blockquote> <div class="quotesBottom"><img src="https://horizon-magazine.eu/sites/all/themes/horizon/images/quotes_bottom.png" alt="" title="" /></div> </div> </p> <p>The alternative packaging is based on Durapulp, which is a bio-composite developed from a wood fibre and a biopolymer from Fresh consortium partner Södra, of Sweden. Through the use of renewable raw materials, Durapulp is environmentally friendly and ready for mass production.</p> <p>With headquarters in Finland, Huhtamaki researchers, led by Harald Kuiper in the Netherlands, have been working to create a tray that will cook the food safely and can handle the temperatures and humidity of a microwave or conventional oven.</p> <p>Not content merely with materials that have much greener properties, the Fresh team is aiming for food packaging trays with a sustainable source, as well as strength and stability when heated during cooking, delivering functional improvements for the consumer.</p> <p>While Fresh is focused on the ready-meal market, success could point to new areas for future exploration, such as takeaway, ready meals or even airline meals.</p> <p>‘A fully bio-based ready-meal package is vital to ensure that more sustainable products are fabricated in the packaging industry,’ Davey said.</p> <p><em>The research in this article has been supported by the EU. If you liked this article, please consider sharing it on social media.</em></p> <p> <div class="moreInfoBlock"> <h3>Re-inventing plastics</h3> <p>The first ever <a href="http://ec.europa.eu/environment/waste/plastic_waste.htm" target="_blank" rel="noopener noreferrer">European Strategy for Plastics in a Circular Economy</a> is an EU plan to transform how plastics are produced, consumed and recycled. The strategy is intended to support industry while contributing to sustainability goals and the fights against marine litter and climate change. Plastics play an important role in the economy and the strategy is designed to address the particular challenges of plastic production such as pollution and reuse.</p> </div> </p> <p><a href="http://bit.ly/newsalertsignup" target="_blank" rel="noopener noreferrer"><img src="https://horizon-magazine.eu/sites/default/files/news-alert-final.jpg" alt="" width="983" height="222" /></a></p> <br /> <img src=”http://www.google-analytics.com/collect?v=1&tid=UA-40077089-1&cid=not-so-fantastic-single-use-plastic-to-get-an-eco-friendly-makeover&t=event&ec=republish&ea=read&el=not-so-fantastic-single-use-plastic-to-get-an-eco-friendly-makeover&cs=republish&cm=republish&cn=republish&cm1=1" /> This post <a href="https://horizon-magazine.eu/article/not-so-fantastic-single-use-plastic-get-eco-friendly-makeover.html">Not so fantastic single-use plastic to get an eco-friendly makeover</a> was originally published on <a href="https://horizon-magazine.eu/">Horizon: the EU Research &amp; Innovation magazine | European Commission</a>. It may come as a shock to some, but around half of all the plastic products in the world are used only once. After they enter the waste stream, these practically indestructible synthetic materials end up in landfill or oceans, persisting in the environment for hundreds of years. Consumer awareness is growing, and improved recycling methods help to alleviate the problem. But while plastic packaging accounts for almost two-thirds of all plastics used in the EU, less than half of it is ever recycled. Reducing the volumes of plastic entering the waste stream at source would be one very effective way to prevent pollution. To do this means developing alternative packaging made from biodegradable materials derived from organic sources such as wood pulp and waste milk. These could be as versatile as synthetic plastics while being much more environmentally friendly, and be used for products ranging from dishwasher detergents and swimming pool chemicals to ready-made meals and even foodstuffs like cheese. 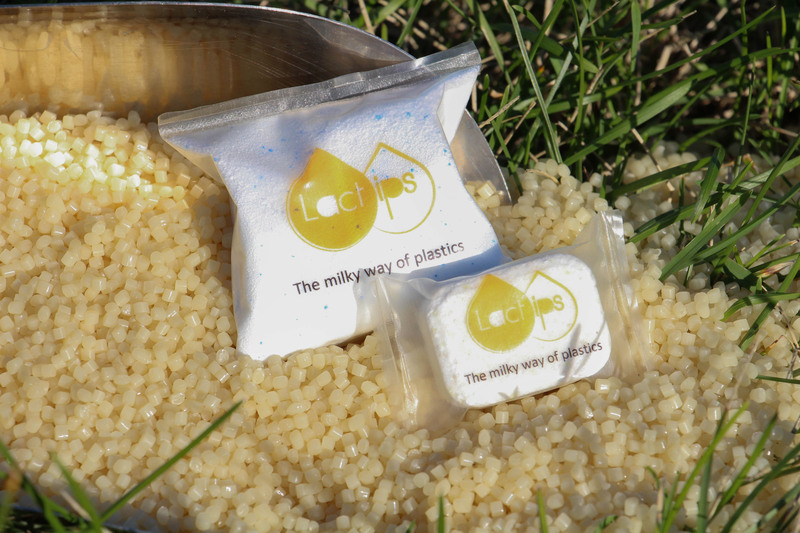 Through a project called Ecolactifilm, French company Lactips has developed a patented, milk-based thermoplastic packaging material that is biodegradable and water-soluble at low temperatures. The packaging film is based on casein – a protein derived from milk – and breaks down harmlessly in water or home compost. It takes just three weeks to biodegrade, claims the company. ‘It is a truly disruptive innovation, and we can now make what was previously not possible,’ said Jean-Antoine Rochette, chief financial officer of Lactips and the company’s project officer for Ecolactifilm. Disruptive innovations are ones which have the potential to fundamentally change a market. Forming a good oxygen barrier to help keep goods fresh, the material can readily be printed with labels or usage instructions. Proposed applications for Lactips’ packaging include water treatment, agrochemicals, dishwasher capsules and even edible food packaging. ‘The main thing of interest (to industry) is that our product is fully water-soluble and fully water-soluble at cold temperatures,’ Rochette said. Lactips, which is based near Lyon, only uses milk that is unfit for human consumption for its non-food applications. The material is produced as small plastic pellets called nurdles that, with some adjustments, can be used in existing plastic processing machinery. But because it can be formed at lower temperatures than oil-based plastics, the process also saves energy. By using leftover protein from milk that is suitable for human consumption, however, another potential application for Lactips is edible-grade food packaging. This makes for strong prospects in packaging cheese, a substantial industry in France and other parts of Europe. It also makes for a certain symmetry, where both the product and its edible wrapper are made from milk. As awareness of plastic waste is growing, so too is the demand for more sustainable products. Responding to this, a project called Fresh is working to demonstrate that bio-based raw materials are a good alternative to ready-made food packaging and can biodegrade in compost after use. If you have ever consumed a ready-made meal from a supermarket or delicatessen, you probably took delivery of your food in a black plastic tray. After a one-time use, the trays are discarded and although some of these containers are incinerated, others just end up in landfill. The alternative packaging is based on Durapulp, which is a bio-composite developed from a wood fibre and a biopolymer from Fresh consortium partner Södra, of Sweden. Through the use of renewable raw materials, Durapulp is environmentally friendly and ready for mass production. With headquarters in Finland, Huhtamaki researchers, led by Harald Kuiper in the Netherlands, have been working to create a tray that will cook the food safely and can handle the temperatures and humidity of a microwave or conventional oven. Not content merely with materials that have much greener properties, the Fresh team is aiming for food packaging trays with a sustainable source, as well as strength and stability when heated during cooking, delivering functional improvements for the consumer. While Fresh is focused on the ready-meal market, success could point to new areas for future exploration, such as takeaway, ready meals or even airline meals. ‘A fully bio-based ready-meal package is vital to ensure that more sustainable products are fabricated in the packaging industry,’ Davey said. The research in this article has been supported by the EU. If you liked this article, please consider sharing it on social media. The first ever European Strategy for Plastics in a Circular Economy is an EU plan to transform how plastics are produced, consumed and recycled. The strategy is intended to support industry while contributing to sustainability goals and the fights against marine litter and climate change. Plastics play an important role in the economy and the strategy is designed to address the particular challenges of plastic production such as pollution and reuse.